Bel Ombre - Dylan Frittelli eagled his final hole on Friday to move into a share of second place after the second round of the Mauritius Open being played at Heritage Golf Club. He started his round on the 10th, and he finished his round with two birdies and an eagle in his last four holes to take up station one shot off the pace set by first-round leader Arjun Atwal of India. He followed his opening course-record 62 with a one-under 70 to move to 10-under at the halfway mark. 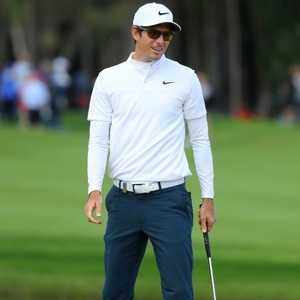 Playing the shortish par-four ninth, Frittelli exhibited all his new-found length when he hit his tee shot to within a foot and made the eagle putt. "I hit a pearler of a drive with three-wood to kick-in distance for the eagle," he said. "Yesterday I hit it probably 14 or 12 feet away as well. So, the tee shot sets up nicely drawing into the wind. I felt comfortable there. I just gave it a go. I mean, it's 296 to the flag, I think, so driver's landing on the green and probably clearing it, and three-wood’s just short. I hit a really good little fade in there and worked out. Got a good bounce, I think." Atwal was nowhere near as good as he was in his opening round, but was pleased to keep his nose in front. "The putter was definitely not as hot as the first day," he said. "I was hitting the ball just as good but it is tough to follow up a 62 with another low round. I'll take this one-under." Frittelli's eagle sets him up nicely for a weekend charge, something which has become something of a trademark of his over the last couple of weeks. "If I was within five shots of the leader today, I would still feel confident," he said. "You know, this is week five in a row for me. I'm definitely on form now, I've played a lot of tournament golf in the last five weeks and it’s showing in my performance." Sharing second with Frittelli were compatriot Louis de Jager and Laurie Canter of England. "I've played some really good golf over the last two days," said De Jager. "Overall, I've hit the ball well and my short game was good today. I'm feeling very good going into the weekend. I'm hitting the ball so well, I'm putting well, I'm chipping well, so it's going to be a fun weekend." Canter had to come through the European Tour's Final Stage of Qualifying School to get his playing privileges back, so he is thrilled to be in contention. "I'm delighted with the two days really," he said. "If you can drive the ball half decent around here you’ll have a fair few opportunities to score and get the wedge in your hand a lot. The weekend will be fun." There were five players a further shot back on eight-under, including South Africans Ockie Strydom, Justin Walters and Oliver Bekker, with 2010 Open champion Louis Oosthuizen lurking another shot back on seven-under with Zimbabwe’s Mark Williams. For Frittelli, who looks as if he’s stepped up a level over the last few weeks, all his efforts are starting to line up and point towards a great 2018. "It's probably two years of hard work and a lot of good specific work the last year," he said. "I did about six months just working on the mental side and the physical side, trying to get everything into top shape and I've done that pretty well throughout the year." The great year could start in Mauritius.